Siddhivinayak Temple is one amongst the most crowded and most revered temples of India. The establishment of this temple dates back to early nineteenth century. In 1801, Siddhivinayak Temple was built by Mr. Laxman Vithu in the company of Mrs. Deubai Patil. Located at Prabhadevi in Mumbai, Siddhi Vinayak Mandir is the most visited temples of Mumbai. Siddhi Vinayak Temple is dedicated to Lord Ganesha, who is considered as the lord of beginnings. Inside the temple, there a small hall (Mandapa) along with the shrine and one can see the image of Siddhi Vinayaka here. Siddhi Vinakaya is said to be the provider of good wishes. The main doors of the shrine are made out of wood and various images of Ashtavinayak are carved on it. These images represent eight manifestations of Lord Ganesha in Maharashtra. In the sanctum, the ceiling is covered with gold sheet, making the exact crown of the Lord. Here, Ganpati is shown with four arms holding a lotus flower, an axe, plate of modakas and a garland of beads, in each of his hands respectively. The two consorts of the Lord, Riddhi and Siddhi, adorn the site being placed on the either side of Ganesha. The temple complex also comprises image of Lord Hanuman near the main entrance. On Tuesdays, people come to this temple in large number as it is regarded as the ruling day of Lord Ganesha. Devotees come here long before the opening timings (before dawn) of the Temple, just to ensure that they will get the glimpse of Lord Ganesha. It is believed that Lord Ganesha fulfills all the desires and wishes of his true devotees. In 1994, the temple was renovated to hold the huge crowd. During the festive time of Ganesh Chaturthi, Siddhivinayak Temple is thronged by incalculable number of people. Many television sets are installed for the knowledge of those, who do not have much time to wait in the long queues that lead to the main shrine. 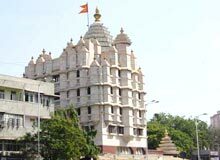 Siddhivinayak Temple also makes a major landmark of Prabhdevi in Mumbai. Outside the temple, there is a narrow lane that is known as 'Phool Gali'. Here, one can see numerous stalls selling coconut, tulsi flower garlands and an assortment of sweets. However, Ladoo or Modak (pear shaped yellow sweet) finds the special attraction as it is the favorite sweet of Ganesha.